According to legend, beneath Victorio Peak (actually a less than impressive 500-foot hill) lies a fabulous treasure of 16,000 gold bars, priceless relics, and seventeen skeletons that kept a vigilant watch. The peak, named after Apache warrior, is located on a deadly stretch of land known as “Dead Man’s Trail,” for those who lost their lives to drought or marauding Apaches. 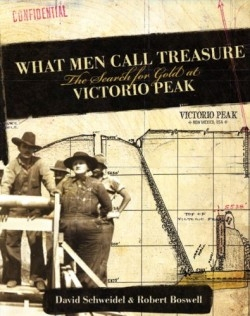 In What Men Call Treasure: The Search for Gold at Victorio Peak, authors David Schweidel and Robert Boswell, spin a yarn about the treasure hunt that began in 1937 when Ernest “Doc” Moss, an ersatz podiatrist, and his first wife Babe, claimed to have discovered the fortune. A careless mining explosion re-buried the treasure, and frustrating attempts to re-unearth the wealth carried on through the 1970s. Terry Delonas, Babe’s grandson who grew up on tales of the treasure, decided to rekindle the search for the fortune. Delonas’s hunt makes for a sometimes quirky, always entertaining tale, full of strange characters, government intervention, and no small number of mistakes. Public libraries in which travel and adventure accounts are popular will want to buy this one.